Britain’s roads are getting worse with one in six of them classed as in poor condition. The result is a backlog of 13 years’ worth of required repair work. The most accurate survey into the state of the nation’s carriageways now shows the number of potholes being filled in England and Wales is up by a third to 2.7 million. And it reveals that the amount of compensation paid to drivers whose vehicles have been damaged by unavoidable holes in the road has rocketed. Here are the main findings of the 2015 Annual Local Authority Road Maintenance (ALARM) survey of councils, produced by the Asphalt Industry Alliance (AIA). The total number of potholes filled across England and Wales last year came to 2,670,350. 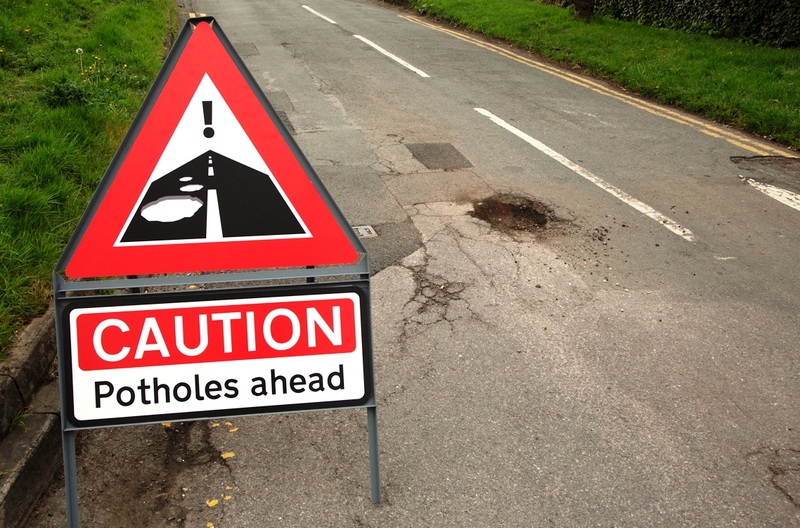 That means each council filled on average 15,706 potholes. Local authorities believe it will cost £12.16 billion to bring all the nation’s roads up to scratch. Based on current budgets, it would take 13 years to clear the current maintenance backlog. The amount of money paid to road users whose vehicles have suffered damage through potholes has doubled since last year. Local authorities in England and Wales (excluding London) paid £20.2 million to compensate drivers. However, while the sums have increased from £11.1m in 2014, the number of claims is broadly the same. On average, each local authority dealt with 544 claims in the 2015 report, up from 540 the year before and just 300 in 2011. See how to claim here. Britain’s roads: Why are they in such a poor state? In short, a lack of funding for years on end. As successive governments have cut budgets for Britain’s roads, carriageways are now only fully resurfaced once every 63 years on average. The result is councils are forced to carry out work that’s known as reactive maintenance. Since carriageways are so old, the amount spent on these fixes is almost double the ideal proportion of local authority roads’ budgets. In England, this stood at 23 per cent where the ideal proportion is 12 per cent. Britain’s roads: What’s at the root of the problem? The ALARM survey puts the pothole proliferation down to the continuing trend for wet winters, record rainfall and severe flooding. It concludes: “Water is the most severe threat to road conditions in this country as it can undermine the lower, structural layers which, if not quickly rectified, can lead to major damage that is both costly and time consuming to repair. Unfortunately, the effects are often only seen on the surface and treatments there may not be sufficient to address the underlying cause.” More than a third of local authorities reported unforeseen costs as a result of adverse weather. This average additional cost per authority has seen a three-fold increase in England from £1.6 million in 2014 to £5.7 million this year. Britain’s roads: Are they getting any better?